Essex head coach Chris Silverwood says his team must refocus quickly after Monday's T20 Blast quarter-final defeat by Nottinghamshire. The Eagles missed out on a Finals Day place after a dramatic batting collapse saw them slump to a 39-run loss. But Essex are top of Division Two in the County Championship and still in the quarter-finals of the One-Day Cup. 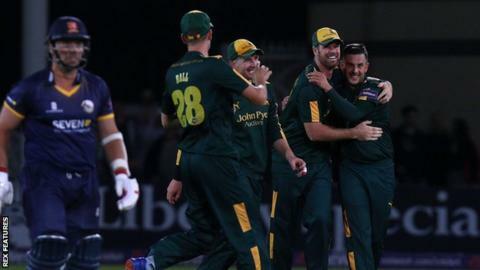 "We are still in two competitions, I think it's important we remember that," the 41-year-old told BBC Essex. "Obviously we're really disappointed, it hurts, as it should do, we have to build ourselves back up now," the former England and Yorkshire paceman added. Monday's match at Trent Bridge came just 24 hours after the conclusion of their drawn County Championship match against Sussex at Colchester which sent Essex one point clear at the top of Division Two. But Silverwood said they were not using that as an excuse. "We had a few tired bodies kicking around but it is what it is, the schedule is how it is, we've got to get on with it," he added.